This post was last updated on April 25, 2015 to include new images and a recipe video. For the longest time, I never cooked steak. I relied on Dustin to grill them on our outdoor grill because that’s the way I liked steak. It’s silly, but I looked at making steaks as his job for whatever reason. Then, one glorious night, we ran out of propane for the grill. So, I decided to cook the ribeyes on my own and discovered just how ridiculously easy it is to make tasty steak in my kitchen. And, yes, it was that epic. You’re not gonna believe how easy it is to make amazingly fast, juicy and perfect pan roasted steak. It’s so dang easy, you can make it in about 10 minutes. It will literally take longer for the oven to heat up to the right temperature than it will to cook these babies. While using a simple blend of kosher salt and freshly ground black pepper is a fantastically good way to enjoy these steaks, I prefer to use this homemade seasoning salt because it has a bit more oomph. And I like oomph. Usually. 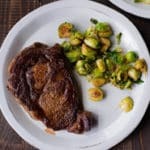 Please, please, PLEASE try this easy pan roasted steak recipe out for yourself to see how amazingly good oven-roasted steak can be. I promise — once you try it, you’ll want to have steak for lunch and dinner and maybe even breakfast for at least a week. 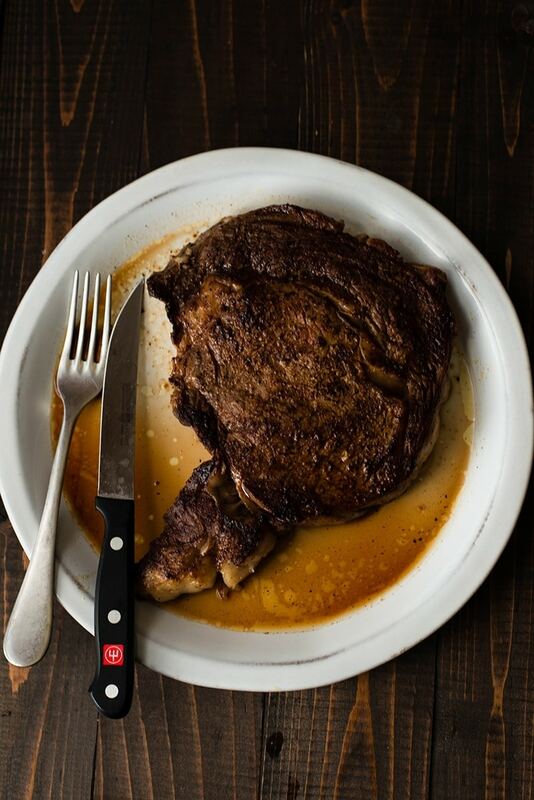 Until you get so sick of eating stupidly delicious steak you’ll have to stop. It’s possible. It happened to me. But, now I want more steak. 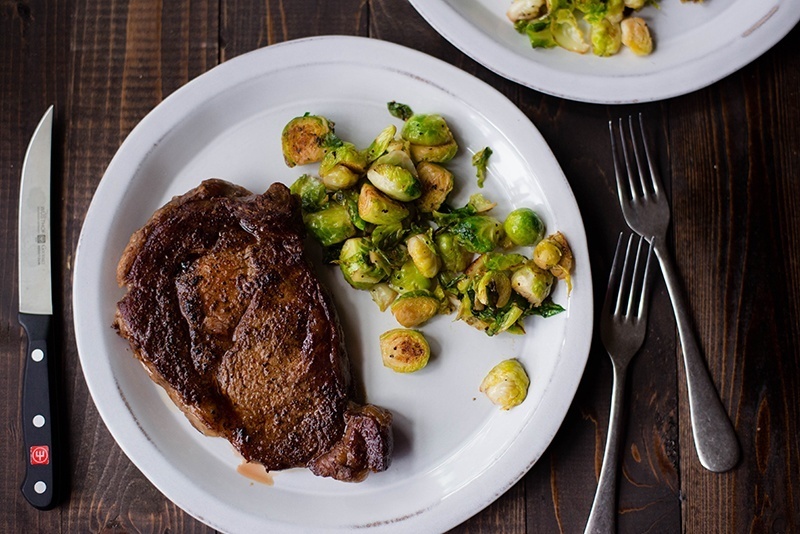 Make yourself a delicious, juicy and flavorful pan roasted steak. Place steak on a flat surface and allow to come to room temperature while you make the spice rub (next step). Mix together the salt, pepper, paprika, garlic powder, granulated onion, and sugar in a small mixing bowl. This will be the seasoning you will add to the steak. Generously coat the steak with the seasoning salt -- you will have left-over seasoning. Heat a large, oven-safe skillet over high heat. Once hot, add the oil and allow to get hot. 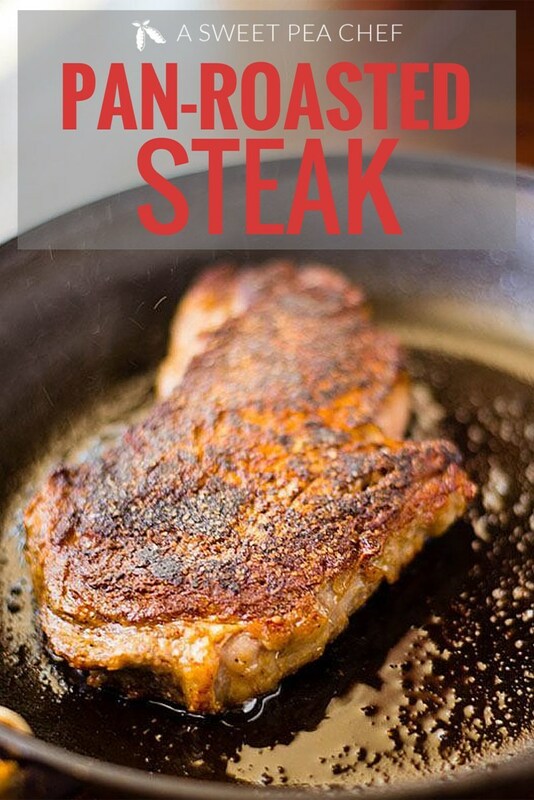 Once oil is hot, place the seasoned steak in the pan and sear for 1 minute. Flip and sear for an additional minute on the other side. Place the pan into the oven and cook for 3 minutes. Flip the steak and cook another 3 minutes in the oven. Carefully remove the pan from the oven and then the steak from the pan. Cover the steak with aluminum foil for 5 minutes. This timing will result in the steaks being medium -- perfectly pink and juicy. I was wondering how I would alter the cook time for a more cooked steak? Instead of medium maybe medium well? Hi Patty. Good question. I would cook each side of the steak on the stove top for an additional minute on each side, so a total of 2 minutes per side. Then, in the oven, I would leave on each side for 4 minutes per side, as opposed to 3 minutes. I hope that works for you. I haven’t tried to cook to that level of doneness with this technique, but this should work. I’d love to know how it turns out! I am going to make this at the weekend, but in England we dont seem to have granulated garlic? Please advise. Hi Ellen! Do you have access to garlic powder?